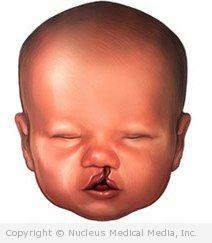 An oral-facial cleft is a birth defect. It occurs when the lip or the roof of the mouth do not form properly. The defect may include a cleft lip, a cleft palate or both. A cleft lip is a gap in the upper lip. It is usually just below the nose. A cleft palate is a gap in the roof of the mouth or in the soft tissue at the back of the mouth. In the majority of cases, a cleft lip and cleft palate may both occur. Early in pregnancy all babies have an opening in the lip and palate. As the baby grows these openings should gradually grow together. By birth, the openings should be closed. For some reason, in children with oral-facial clefts, these openings fail to close. The exact reason these openings don’t close is not known. A geneticist can best define the actual risk, which can vary greatly among families. In general, if one child in a family has a cleft palate, the next child has about a 4% chance of also having a cleft palate. If only the lip has a cleft, the risk of this occurring in a second child is about 2%. The major symptom of a cleft lip and/or cleft palate is a visible opening in the lip or palate. A doctor can diagnose cleft lip or cleft palate by examining the newborn baby. A newborn with an oral-facial cleft may be referred to a team of medical specialists soon after birth. Rarely, a mild cleft palate may not be diagnosed for several months or even years. Cleft lip and palate are sometimes associated with other medical conditions. Your doctor should be able to tell you whether or not your child’s cleft is as sign of a larger condition. Some of these conditions may need additional treatment. Your doctor may be able to see a cleft lip before birth. It may be seen during an ultrasound examination. A cleft lip can be seen as early as 18 weeks of pregnancy. Cleft palate may be harder to see before birth because they are inside the mouth. Treatment can not be started until after birth. However, diagnosis during pregnancy will give the parents and the medical team time to prepare a care plan. A cleft defect can make it difficult for your child to eat or drink. Your child may be given a dental plate. It is placed in the roof of the mouth. It should make it easier to eat and drink until surgery can be done. Hearing testing should be done regularly. Rarely, children with cleft palate may benefit from hearing aids. Do not smoke or drink alcohol during pregnancy. Talk to your doctor about any medications during pregnancy. Only use them as directed by your doctor. Seek medical advice on additional ways to prevent the disorder.